This was first featured on Space Wolves Blog which is now lost to the warp. In an effort to retain the information we have republished it here. A combi plasma conversion is actually quite hard, but it gets a lot easier with a little bit of practice. So watch and learn! You need a storm bolter arm, a plasma pistol and a bolt pistol. Plus some green stuff modelling putty. 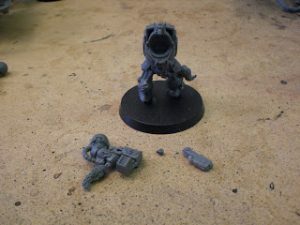 While you get plenty of Space Wolves plasma pistols, what you really want are the basic Space Marine plasma pistols. I’m sure your Space Marine playing buddies will have mountains of the things, because no one likes to field them considering their extortionate points cost. Finally, make sure all of these components have been cleaned of flash and mold lines before you begin. 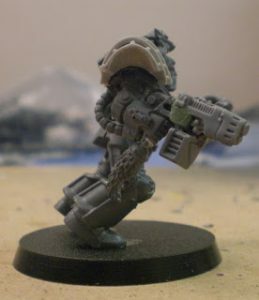 Start by chopping the front off the storm bolter. That’s both barrels, the sight and the stubby bit underneath. Its only going to get in the way once we start carving this thing out. 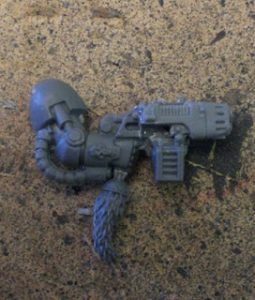 Next, cut the plasma pistol free from the space marine had. I find it’s best to severe the hand at the wrist first. Then line up the knife edge along the top of the gripping hand and cut clean through. You may end up with a bit of flash on the other side. Simply cut this off. To get a flat surface where the hand was, use a modelling file, or scrape the blade edge backwards along it, smoothing the surface. Finally, take your bolt pistol, line the knife edge up with the stock of the gun and cut clean through, severing the barrel and the little sight above it. This piece is tiny so make sure you don’t lose it. 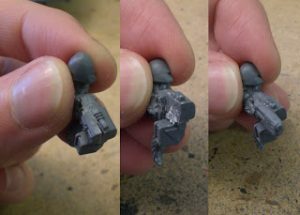 Take the storm bolter and using your knife, mark a line across the top, just to the left of the central bit on top. Then mark another line straight down. This will help you to cut a rectangle out of the side of the gun. I start but lining up the knife blade with the back of the ‘boxy bit’ and cutting down. Then I do the same thing on the underside of the ‘boxy bit’. This makes it easier to get the main chunk of plastic out later. Remember the two lined you made? One across the top and one down the front of the ‘boxy bit’? You’ll need to use these as a visual guide when you cut along them both at the same time by coming in with the knife blade at a 45-degree angle on the front corner of the ‘boxy bit’. Once you’ve cut as deeply as you can without accidentally cutting into the rear parts of the gun or down into the magazine, you’re ready to start getting the plastic out. Lay the gun on it’s side and start cutting down, to remove a small triangle of plastic at a time. You can keep doing this quite easily until you get towards the back of the gun. Then it’s a case of wiggling the point of the blade carefully beneath each small section and carefully cutting it out until you’ve got a nice big space where half of the gun’s ‘boxy bit’ used to be. See, I said this was going to be the hard part. But now it gets easier. Take your plasma pistol and trim the inside, removing the two dimples near the front and little piping at the back to get a smooth, consistently flat surface. Next you put some polystyrene cement glue in the empty rectangle where you want it to go and stick it in. The plasma pistol probably won’t fit perfectly. So check it from all angles to ensure a good, straight fit. Does it look straight from the side? You can also get the top of the plasma pistol to blend better with the storm bolter’s ‘boxy bit’ by putting more polystyrene cement across the join. I love this stuff because it melts plastic beautifully. Just make sure you don’t get your fingers in it and then touch your model, or it will start eating the detail! Now, leave it to dry overnight. I know you want to finish your conversion NOW, but this is quite a fragile conversion and needs time to set properly before you get to the next part. Glue the bolt pistol barrel and sensor to the front of the storm bolter using some polystyrene cement. Make sure you check the fit first as it may need a tiny bit of trimming to get it lined up straight. Give it 10 minutes to dry and we can get on to the Green Stuff. Always take half as much as you expect to use. I’m sure this stuff expands after you knead the yellow and blue halves together. Once you’ve got your little ball of properly mixed Green Stuff, press it into the gap below the back of the plasma pistol. Take your knife and use the flat edge to gently push the Green Stuff into a square from the front, back and side. Use your thumb to flatten the side facing you. Wet your thumb a little and ever so gently smooth the Green Stuff up, over the lip of the plasma pistol. Tidy up the shape again with the flat edge of your knife and you’re done. Don’t worry, it gets easier with practice. I hated making the first few combi plasma conversions, but after the third it was pretty straightforward.